I have connected ADC to the microcontroller. 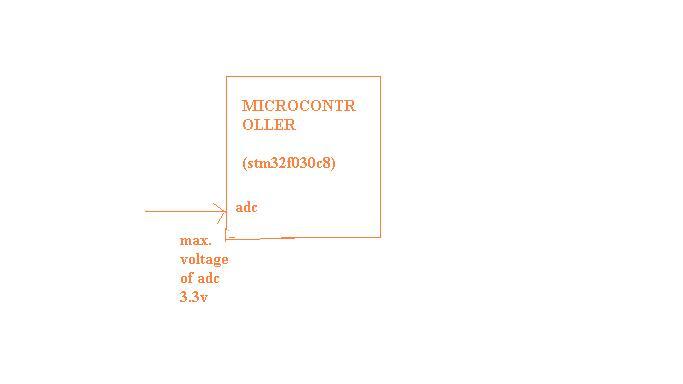 The maximum ADC voltage range of microcontroller is 3.3V. So when ADC voltage is greater than 3.3V should it be grounded or blocked? Can anyone suggest a circuit? The STM32F0 microcontrollers have the maximum value (4096 or 1024) in the ADC when the input voltage is 3.3V, but some pins support 5V as a protection medium. The ideal is to have an input circuit that reduces the voltage, following the example of a circuit for inputs from 0V up to 5V. Note that ADC_0 is the pin of the microcontroller. Not the answer you're looking for? Browse other questions tagged microcontroller adc or ask your own question. How can I measure voltage in range -15 V to 50 V with an ADC in a microcontroller in a single circuit arrangement for scaling? Over-voltage protection for microcontroller ADC input pin.